4 July - I am slowly catching up with things in the garden. 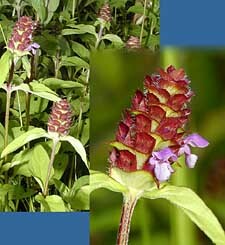 Yesterday the first of the Selfheal plants (Prunella vulgaris) started flowering yesterday (last year it was on 24 June - ten days earlier). An adult Wood-pigeon has become a regular visitor to the garden recently. A 'cage' I had around the feeder was blown away in a storm and has not been replaced. At the moment the adult is feeding from the tray below the feeder. If it moves its attention up to the feeder itself I may have to make a new cage. Anyway, the picture is of a young Wood-pigeon that has started visiting in the last three days. Not as wary as the adults, It does not yet have the distinctive green, purple and white patch on the neck, although I think I saw the first signs when I got close to it today. The Blackbirds are taking a lot of food away at the moment, and the male robin who seems to be giving some of it to his partner. 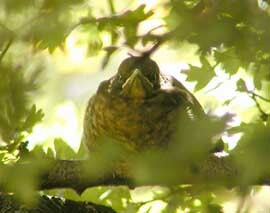 I still haven't caught sight of any young robins. At the beginning of the week I caught a brief glimpse of some House Martins for the first time this year. 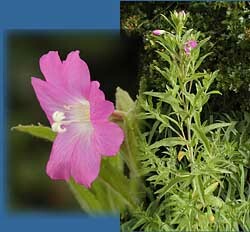 6 July - The Great Willowherb has now started to flower. The first one opened yesterday, but it was not fully formed as a result of insect damage to the bud. Today a second, complete flower opened and there are a lot more buds developing. 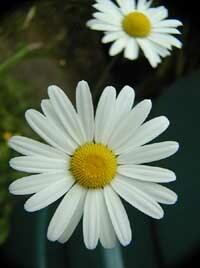 Yesterday also saw the first of our Oxeye daisies flowering. This is very late - last year they started flowering at the end of May. 7 July - Today has been very disappointing for a July day. Although it hasn't rained it has remained overcast and rather cool for most of the day, with only short periods of sunshine. 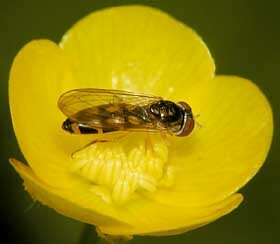 Despite the conditions the hoverflies have been active, and I am including pictures of two types today. This first one spent a couple of minutes on the Buttercup. It is all black in colour and measures just over 6mm in length. I cannot identify it using my guides. This one also fed at a buttercup. 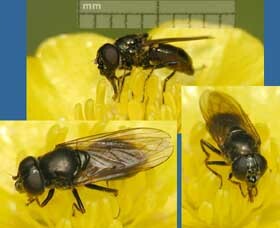 Similar to the Syrphus species, but the abdominal markings do not match any of the types in my guides. This small fly (about 4mm long) is very pale orange in colour and has slightly dusky transparent wings with the tips being darker. Each wing has quite a bold cross vein about half way along its length. When the wings are folded back these veins seem to 'join' together to form a bar that links the wings just behind the rear end of the abdomen. 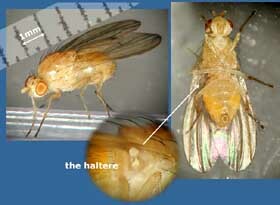 While I can't identify it using my guides I think it is one of the fruit-flies. 10 July - The last couple of days have been rather busy ones with not too much time to watch things in the garden. We are having showery weather as the 'Azores high' that should bring us good weather this month has failed to move North so far. 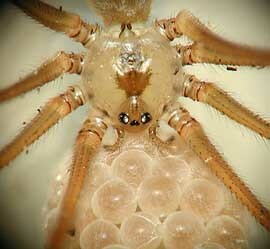 This afternoon, while doing some sorting out I found this female Pholcus phalangioides in a spare wheel. She is carrying her eggs and after I had taken some photographs she walked off, taking them with her. I make no apologies for including a second close-up image of her. To get this image I took a series of four images, focused at different distances and then blended them together. I didn't have time to take as many images as I would have liked as she moved. 13 July - Today we had a glimpse of what can happen if the 'Azores High' visits - it has been a sunny day, with even a few butterflies and a damsel-fly made all too brief appearances. During the afternoon this young (female?) Greenfinch made several visits to the feeding area under the Hawthorn. 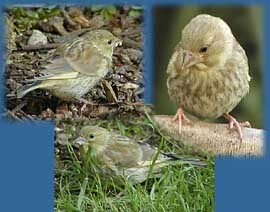 While I have often heard them I have only seen Greenfinches in the garden a couple of times so far this year. 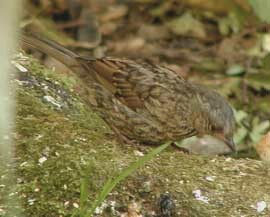 Another surprise visitor made a brief appearance below the Hawthorn in the form of this young Dunnock. Its quick departure allowed me to get only this one blurred image. While I was trying to get some photographs of the Greenfinch, movement deep uder the hawthorn caught my attention. The dark shape, silhouetted among the branches turned out to be a Blackbird fledgling, which was being fed by the male parent. This reminds me. Several times over the last week we have watched the female Blackbird dealing with slugs before taking them away for her young - she removed the slime from them by vigorously rubbing them against the concrete! As I write this I am also watching Leslie Neilson taking us on an adventure in his 'Savage Garden'. Having watched it numerous times I always enjoy it, both his humour and the photographic effects that capture something of the lives of the inhabitants of an American garden. 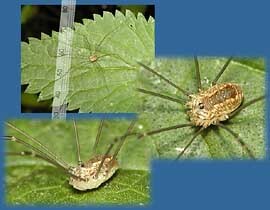 The funny thing was that when I switched channels and found the program, it was showing images of a harvestman while I was in the process of editing some Harvestman pictures I took this morning. This specimen was on a stinging nettle leaf. It was still there in the evening, but had disappeared by dusk. 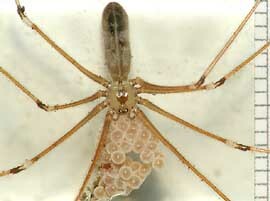 It is probably Leiobunum rotundum, a very common species. 16 July - The weather has continued to be good as the high pressure stays with us. I have been busy doing some pruning and clearing before we head for the West country again this weekend. This time we are going to stay a few days in Plymouth in order to visit the National Marine Aquarium before heading for our caravan on the Lizard. I was watching a TV program last night where Bill Oddie was looking at the wildlife in and around London. At the Tower of London he was lamenting the demise of the House sparrow. As I watched him, our flock was fighting over the rights to the feeder. Earlier this morning I took this picture of a male sparrow having a dust bath in an old satellite dish put out for the purpose. The dish sits on an old brake disc from my car and has sieved soil in it and I keep it under the caravan cover so that it is kept dry. 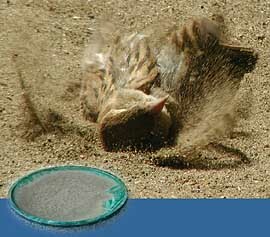 When the sun shines the soil gets very warm and the sparrows love it. 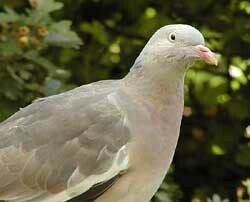 The Wood Pigeons are becoming frequent visitors now and dominate the feeder when they arrive. I am going to replace the 'cage' around the feeder later today (the old one having been blown away in a storm). Last year, at the end of June I wrote about a small fly that I watched, apparently egg laying in the flower buds of a ragwort plant. Well, this morning I spotted what seems to be the same species again on a ragwort in the same spot. 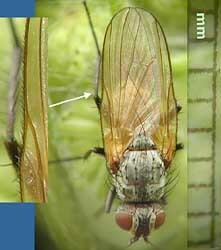 The fly itself is about 5mm long although with the wings folded back is measures about 8mm. 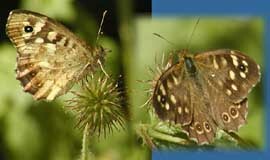 The wings, which have a slightly orange tint, appear to be unifrom in colour and the leading edges (costa) are edged with a rim of short black hairs (or spines). The ragwort has not yet flowered, although I think the buds will open in the next day or so. Now, I must take a trip to our local recycling centre with a car boot(trunk) full of rubbish. Having returned from my mission, a sad event greeted me. As I got out of my car I heard Blackbird warning calls and when I opened the garden gate a Sparrowhawk flew up from beyond the pond. It didn't take a moment to see that a Blackbird had been caught - a patch of feathers marking where it had been. The hawk flew up to the top of the trees and then left. The female Blackbird flew up to the same spot and spend ages calling, and sometimes uttering the quiet squeek that seems to say 'where are you?' 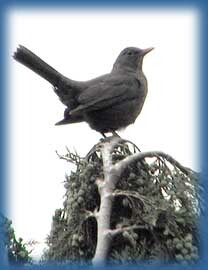 in Blackbird language. They had at least one offspring (pictured above), and the flight feathers seem to have a brown edge to them - I hope she hasn't lost her partner. I shall be watching the garden for any signs of the family. 19 July - The weather has continued to be good, but unfortunately I spent little time taking photographs as we prepare to head for Cornwall. Today I spent a good few minutes watching a pair of Speckled Wood butterflies in an aerial ballet before one landed long enough for me to get a few photographs. There has also been the first action at the bamboo bee hotel used by leaf cutter bees last year. Some bees have obviously emerged, and a couple of bees have been clearing out old materials. I have still not seen a male blackbird in the garden since the Sparrowhawk attack although I have seen the female and an offspring several times. Back on the 6th I said about the Great Willowherb coming into flower. That plant is doing well but several smaller specimens have so far failed to flower. Their flower buds have been attacked by small larvae. I'm afraid I have not taken any photographs of them. Sheila and I are off to Cornwall now. Before going to our caravan, we are going to Plymouth to visit the National Marine Aquarium. I hope to make some diary entries during our trip, although they will probably not be uploaded to the site until we are home, sometime in the second half of August. In the meantime my sons will be guardians of the garden (and the house)!